Now available online, a restock of Sabina Savage. 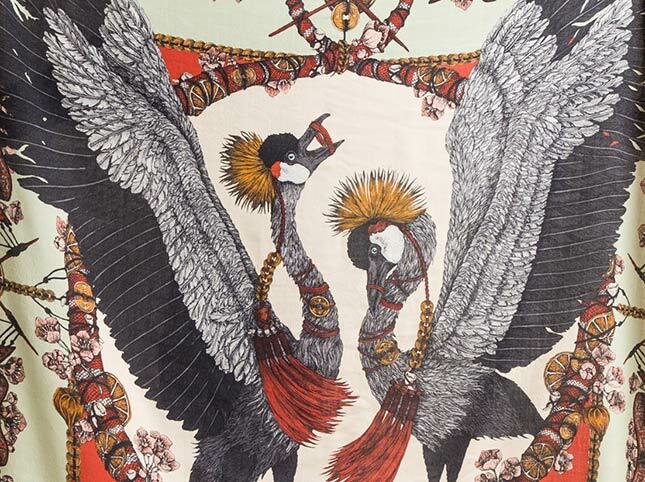 From the Fall/Winter 2017-18 collection entitled The Sultan’s Soldiers, we have a re-order of Tipu’s Hound and the Pheasant Tree, as well as The Cranes of Canton, Karo, Lupus, and The Dancing Fox from previous seasons. All scarves feature a printed motif hand-drawn by Sabina in London and then produced in Como, Italy with the highest quality fibers of silk, wool, and cashmere by skilled artisans. This latest shipment is available online and in-store at Santa Fe Dry Goods on the Plaza in Santa Fe, New Mexico.